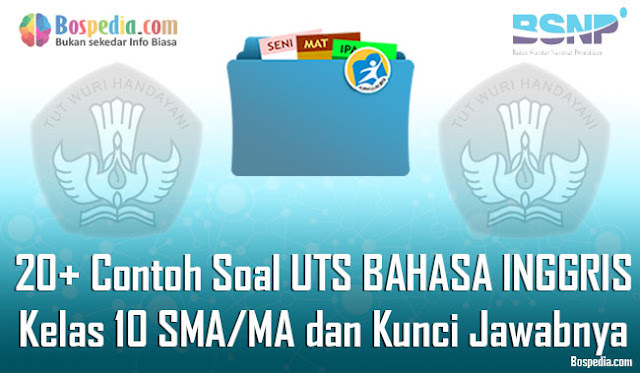 20+ Contoh Soal UTS BAHASA INGGRIS Kelas 10 SMA/MA dan Kunci Jawabnya Terbaru - Hai adik adik yang baik, nah pada kesempatan kali ini kakak selaku admin bospedia ingin membagikan beberapa contoh soal UTS Bahasa Inggris yang dibuat khusus untuk kelas X SMA/MA. Soal ini merupakan soal dari semester ganjil. Nah kakak juga akan membagikan kunci jawabannya disetiap soal. Jadi adik adik tidak perlu kawatir yaa. I. Choose the correct answer by crossing a, b, c, d, or e! My name is Hani. Layla and I live next to each other. …(1) often go shopping together. Layla is …(2) best friend. On Sunday, …(3) came to visit me and saw a new car outside. “Does that car be long to you?”, she asked. “Where is …(4) old car?” No, it’s not …(5)”, I said” …(6)” belongs to david and Fatima in next door. It’s …(7) car. Pembahasan: menggantikan kata 'car' yang dimaksud dalam teks. Helen visits Naiya in Brazil. Naiya tells Helen about the famous Samba Festival which occurs once in a year. Helen is so happy to hear that. She wants to learn how to dance Samba. They both travel around before they see the festival. They visit some places which introduce the culture of Brazil. Helen buys feijoada, a traditional dish in Brazil, and she loves it so much. Naiya then takes Helen to see the festival at night. Helen is so happy and say thanks to her best friend for the unforgettable memories. 9. What festival does Helen visit in Brazil? 10. 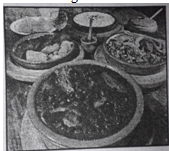 What is the name of the traditional dish that Helen bought? 11. Yuri … to Bali with her sister. 12. Kevin …roses for his grandmother who … in Jakarta. The Great Wall, or Chang Cheng in Chinese, is massive. It begins in the east at the Yellow Sea, travels near China’s capital, Beijing, and continues to west through numerous provinces. It winds like a snake through China’s varied terrain for thousands of miles. Smaller walls extend from the main wall. According to conservative estimates, the Great Wall’s length is approximately 2,400 miles. Its thickness rangers from 15-30 feet wide, and it reaches in height to about 25 feet. The Great Wall has been considered as one of the world’s wonders. The Great Wall is undeniably one of humankind’s most prominent and enduring architectural feats. It is a testament to people’s ability to plan, organize, create and work diligently together. The wall is a monument to the Chinese civilizations, one that came at great costs and through countless sacrifices. 13. Where is the Great Wall located? 14. How Thick is the Great Wall? 15. Where does the Great Wall begin? II. Arrange the words below into good order! Answer: Big ben is located in London. Answer: Dewi and her friends go to Egypt to see the pyramid. Answer: He buys roses for his mother. Answer: She wants to go Italy. III. Write a descriptive text about your favorite tourism object in your city! Safari Park is a quite unique zoo. it lies about 90 kilometers from Jakarta. It is located in Cisarua, Bogor, West Java. In Safari Park, the visitors are not allowed to get off their cars or buses. The animals are grouped in certain blocks. The first block is for wild animals like tigers and lions. The second block is for big animals like elephants, hippopotamus, rhinoceros, zebras, and giraffes. The next block is for primates like orangutans and gorillas. In the last block, we can see bears and ostriches. The other blocks are conventional zoos because some of the animals are in cages like white tigers, monkeys, birds, and crocodiles. Demikianlah informasi yang bisa kami sampaikan, mudah-mudahan dengan adanya 20+ Contoh Soal UTS BAHASA INGGRIS Kelas 10 SMA/MA dan Kunci Jawabnya Terbaru ini para siswa akan lebih semangat lagi dalam belajar demi meraih prestasi yang lebih baik. Selamat belajar! !